FIGURE 11-4 Diagrams showing the relationship of adrenal medulla chromaffin cells to preganglionic neuron innervation and the structural elements involved in the synthesis of epinephrine and the discharge of catecholamines in response to acetylcholine. (A) Functional relationship between cortex and medulla for control of the synthesis of adrenal catecholamines. Glucocorticoids that stimulate enzymes catalyzing the conversion of norepinephrine to epinephrine reach the chromaffin cells from capillaries shown in B. (B) Discharge of catecholamines from storage granules in chromaffin cells after nerve fiber stimulation, resulting in the release of acetylcholine. Calcium enters the cells as a result, causing the fusion of granular membranes with the plasma membrane and exocytosis of the contents. Reproduced with permission from Krieger D. T. and Hughes, J. C. (eds.) (1980). "Neuroendocrinology." Sinauer Associates, Sunderland, Massachusetts. choline receptor at two different sites. This receptor may be unusual in that it has both nicotinic and muscarinic features. Recent molecular modeling work is available on the structure of the nicotinic acetylcholine receptor as shown in Figures 11-5A,B. The four-transmembrane helix structure of this receptor comprises an ion channel formed by homologous structural elements in the sub-units of the receptor (Figure 11-5A). Although the information for this model comes from indirect experiments and modeling, it provides a workable view of the receptor and its inherent ion channel. In the chromaffin cell the process of catecholamine synthesis is ongoing, as shown in Figure 11-6. Tyrosine (or phenylalanine) enters the cell via the blood circulation and extracellular fluid. In the cytosol, tyrosine is converted by tyrosine hydroxylase to dihydroxyphe-nylalanine (dopa) (Figure 11-7). Tyrosine hydroxylase is the rate-limiting enzyme in the synthesis of catecholamines in all adrenergic neurons. L-dopa is converted to dopamine by an L-amino acid decarboxylase located in the cytosol. Dopamine must then enter the neurosecretory granule since the enzyme catalyzing the subsequent catalytic biosynthetic pathway is localized there. Norepinephrine formed within the granule must perfuse out to be converted to epinephrine by the final enzyme of the pathway, phenylethanolamine N-methyltransferase (PNMT), which is located in the cytosol. Norepinephrine, as an intermediate in this overall process, would be expected to occur in lower concentrations in the adrenal medulla, and this is true for the human adrenal medulla where it may comprise only about 20% of the total catecholamines. Obviously, the epinephrine in the cytosol must move back into the neurosecretory granule and is stored there, awaiting secretion. The re-uptake process is linked to an ATPase of the granule membrane. The scenario of movement segments of the receptor subunits). This model is also in accordance with recent computer modeling studies. Reproduced from Hucho F., Gorne-Tschelnokow, U., and Strecker, A. (1994). 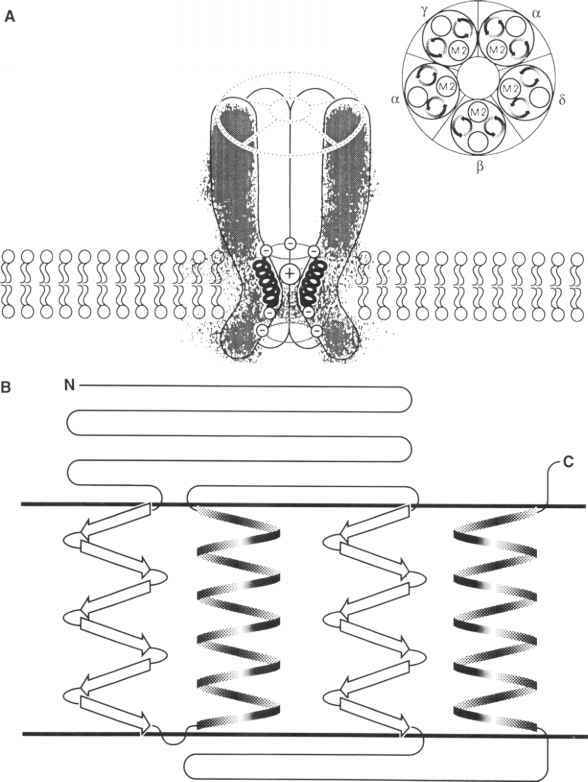 ^-structure in the membrane spanning part of the nicotinic acetylcholine receptor. Trends Biochem. Sci. 19, 383-387. (B) Schematic representation of the transmembrane folding of nAChR subunits. The model takes into account the facts that there are approximately equal amounts of a-and /3-structure and that M2 and probably M4 are a-helices. The structure (arrows), assigned to Ml and M3, is depicted pointing in different directions. FTIR measurements (linear dichroism) have shown that the intramembrane /3-structures are not oriented uniaxi-ally. The intramembrane peptides have not yet been identified. Therefore, the number of membrane passings is hypothetical in this model. Good experimental evidence exists for both the amino and the carboxyl termini being on the extracellular side of the membrane. Reproduced from Hucho, F., Gorne-Tschelnokow, U., and Strecker, A. (1994). /3-structure in the membrane spanning part of the nicotinic acetylcholine receptor. Trends Biochem. Sci. 19, 383-387.
of intermediates in a biosynthetic pathway between intracellular compartments is not new, and we have seen similar movements during the synthesis of the steroid hormones. Tyrosine hydroxylase is the rate-limiting enzyme in the overall biosynthesis of epinephrine (Figure 11-6). It is allosterically inhibited (heterotrophy) by norepinephrine. Presumably the initial enzyme contains an allosteric site with a K, value that from time to time is exceeded by the amount of norepinephrine in the cytosol. This is undoubtedly of physiological significance because norepinephrine cannot be metabolized further without first entering the neurosecretory granule. Although perhaps not rate-limiting for the overall pathway, its concentration in cytosol could easily become effective. Also, the tyrosine hydroxylase rarely functions at maximal velocity and therefore, at least to a certain extent, is probably substrate-controlled. At suitable concentrations, norepinephrine can bind to the allosteric site on tyrosine hydroxylase, producing a change in conformation and a rise in the KmJy. 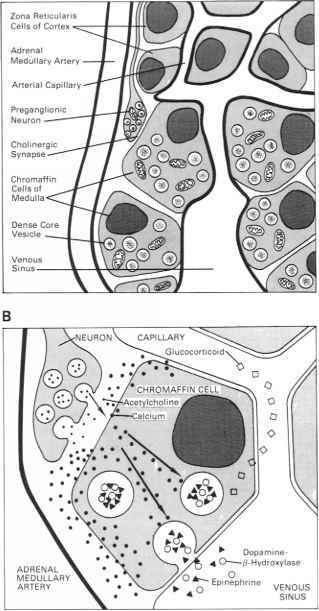 Interestingly, ACTH, which so far we have considered in the context of the zona glomerulosa, zona fascicu-lata, and zona reticularis of the cortex in the stimulation of steroid biosynthesis, also apparently binds to chromaffin cell membrane receptors and stimulates the intracellular level of cyclic AMP. Elevated cyclic AMP levels activate protein kinases, which may phosphory-late some proteins in the cell. The activated protein kinase, alternatively, may translocate to the nucleus where reactions are stimulated, leading to an increased rate of synthesis of tyrosine hydroxylase. Finally, the levels of tyrosine hydroxylase are also under neuronal control. The dopa decarboxylase enzyme does not appear to be under specific hormonal or neural regulation. However, dopamine /3-hydroxylase is a regulated enzyme. Like tyrosine hydroxylase, its synthesis is under neuronal control. Its level in the cell, and consequently within the neurosecretory granules, is also affected by ACTH by way of elevation of the intracellular level of cyclic AMP. The final enzyme in the pathway, PNMT, can be induced by Cortisol mediated by a cytoplasmic glucocorticoid receptor, presumably at the transcriptional level (see Figure 10-14). The extent of the increase in PNMT by Cortisol is only about 50% with long-term stress. Under similar conditions, tyrosine hydroxylase, through the indicated regulators, can be increased 3-fold. Is the synthesis of catecholamines in nerves the same as in adrenal medulla? What re medical biochemistry of medullqa?